No, we're not starting with wizards. We're starting with warriors. All along the way, we'll be sharing concepts, designs and suggestions for the game. Here are a couple to illustrate a bit of how we want your character's look to evolve over the course of character development. Right now, we're planning 13 or so slots for gear on your player character. but where's his wee sporran? And can I hit people in the noggin with a shillelagh? Also, in those 13 or so gear slots, is there room for a pipe and tobacco? You may do your fancy smoke haze +1def with your finger-tips and mad magick tricks, but I'm a bit more old school. Haha, fear not, Finji. 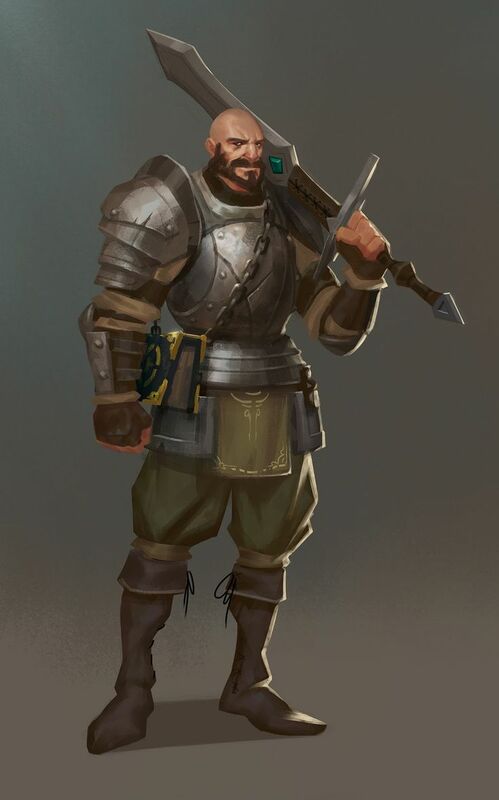 Just for you there will be shillelaghs for clubbing bad guys in the game. And yes, miscellaneous items will abound, of varying levels of usefulness. We're still in planning and working out how we'll deal with your character's various slots and which ones are models and which ones are just items on your person (think Chest pieces as models and rings as not), so your pipe may not visibly show up, but it will be there! Given which slots will models, you will be able to achieve a ton of visual variety for your Character. So while mine will almost certainly be a mage-y trickster with-- as you say-- "fancy smoke haze," your Rogue or Wanderer will use more mundane implements to light your pipeweed. I like hearing the words "Rogue or Wanderer" because I think that's where Darggie will fit in. That's good to hear! Because in Darggie's introduction, (http://paragons.vanillacommunity.com/discussion/13/a-man-cloaked) he has a book. "Lastly, a small book. Today's find, a small book written in a strange language, that has been Darggie's obsession all morning. He just can't, for whatever reason make heads or tails of this language. We watch our friend read over the markings again and again for a while, before he begins repacking his satchel and preparing to leave. " That I have no background for at all, I just thought it would be something fun for you to work with if we take this roleplaying in a serious nature. So don't worry, I already have your back Sir Thrower of Pie. Very sensible carrying a book when adventuring, never know when nature might call eh? Best be prepared. And who knows what interesting rashes all this dangerous flora (and fauna) may produce. Plate mail is good. You can never have too much plate mail. ...It has been joked it's the closest thing I have to a fetish. Let us glom onto the book, then. What's in that book, @SingmeAsong? It is in fact, a 1st Edition copy of How to be a Bard: The Life and Times of Singme Asong by Singme Asong. He looks pretty wizardy to me. Who says use of magic necessitates robes and decrepit bodies? Agreed, @Winsomniak. Wait till you see some of the other designs we're working on for characters. Some will follow the basics but some will depart significantly. I really like the character. Facially and build he is similar to how I saw Doc in the continuum. the book is likely because he is a paladin-ish type character. It's a book of laws or religion. Haha, great pull. Don't worry, you will be able to make your brand of wizards BA. 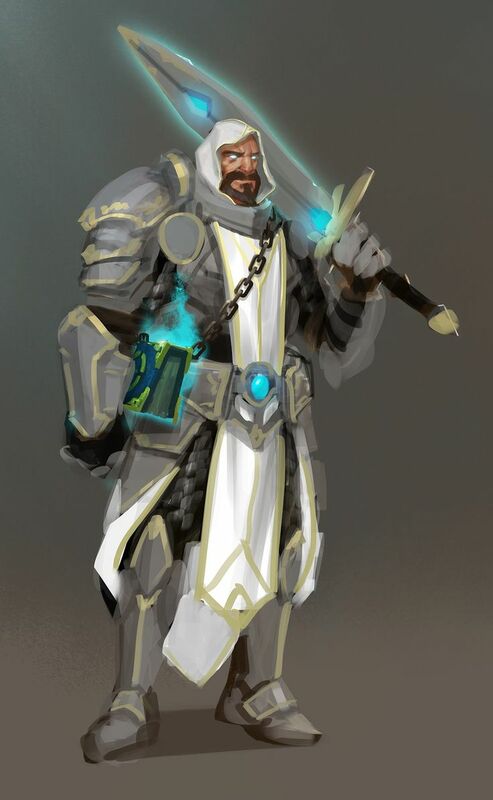 And you got it-- @docgeo, he's developing along a paladin-ish specialty. We have some tasty specialties planned. So far so good on the renderings! The visual builds are key to making me feel like my character is special. I'm special gosh darnit and my character needs to be special too. Having said that, it's exciting to see The Wiz with family / friends / vets back on a good ole' RPG online again! I can only take so much of my apps on my phone. 1. Is Dual Wielding a potential reality? 2. Will there be be a scale level of equippable weapons for all 'classes' or will weapons be set to certain classes? 2. Both (there will be weapons everyone can use and some specialty stuff too). any dice on your character @thewizard ? you mean that we can /roll here in the forums? Bring back the roll rooms! Haha, better harangue @michaeldko about that! Be assured that there will be plenty of interesting ways to getz the treatz tho. To @Winsomniak's point, though, I just saw some "wizard" heads from artist @BIGDIRTYmitch (yes, that's actually his handle), and they are BA. Don't forget about the rogues and backstab. Craftsmen. I want a good selection of craftspeople avatars that will do grunt work for others. I want to looks like I harvested the roots and herbs for your potion. I want to show off the calloused skin from pounding or into bits to be smelted and later turned into metal bars for working. Oh yes-- there will be rogues, rogueing and roguery! Say, will there be "group" content or is it all going to be 1v1 pvp/pve? What about Healy classes? Just remembering my good old order healer back row setup. We're talking about that now-- the combat in Paragons is designed to be mano y mano, so healers, typically the support-type folk would need a bit of reimagining. Which reminds me... we need a Classes discussion, no? Aye we do need a class discussion page. As far as healers and support classes, perhaps this is the area where we implement an element of combat preparation that I was speaking of for Rogues/assassins that healers/support characters can use, like setting up traps, ambushes, distance attacks that can preface combat for a turn or two. It's either that or Support character have a separate gear category for mechs/golems/pets/minions that they buff in combat. The class Page I also second and if you need a Character/skill system/class system individual, I have a wealth of experience to lend to assist in this realm, whether it be methods of forming class tiers to class expansion design to whether it's flowing from freeform class methodology to branching skillsystems to fusion skill design networks. I've seen or worked on them all. I also have a decently vast well of knowledge on classes and things from D&D experience. From a player to a DM, I've done and experimented a lot, and read.... a lot. Perhaps it would be good to add a combat companion that joins you. Something completely AI controlled so it doesn't feel like you are playing a pet class. Speaking of the Element of Class, Well there be side elements to The Class System as far as a Race Systems, Occupation Systems, or Hobby Systems? I can probably scratch Freeform and Standalone off the list given they have names so it's just a matter of Fused vs Tiered I guess then lol.